I Heart Radio will be awarding THIRTY lucky winners with an Invoke Speaker with Cortana by Microsoft that are worth nearly $200 each! 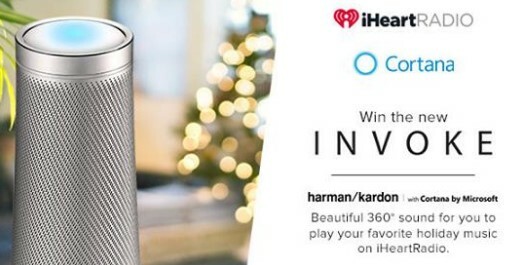 Thirty (30) Prize winners will receive one (1) Invoke Speaker by harmon/kardon with Cortana by Microsoft. Approximate Retail Value (“ARV”): $199.95. This Sweepstakes ends on 12/17/17 and you can ENTER DAILY to win.